2019-02-09 Eden Falls at Lost Valley – Boxley, AR. The Lost Valley Trail is the “go to” hike I usually send newcomers or visitors to the area to. If you only have the time to hit one trail, this should probably be the first. In less than three miles round trip there are several waterfalls (depending on the time of year), a large bluff overhang “amphitheater”, some interesting slides and rock foundations, old growth beech trees, and a cave (bring flashlights), with a big surprise at the end. This painting is 3′ wide and 4′ tall. 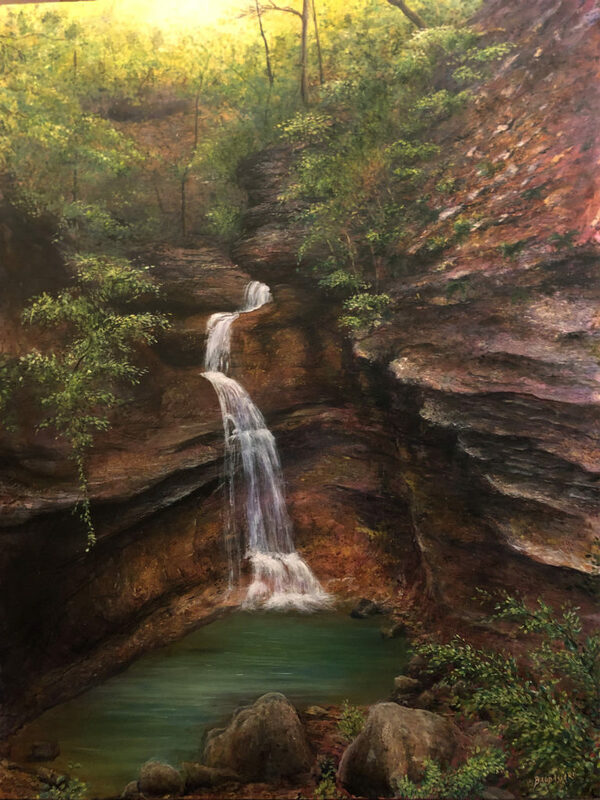 Author scottbaldassariPosted on February 19, 2019 March 23, 2019 Categories Acrylic Painting, LandscapeTags Acrylic Painting, Boxley, Eden Falls, Lost ValleyLeave a comment on 2019-02-09 Eden Falls at Lost Valley – Boxley, AR.